Boiled apples have a unique consistency that can add a twist of variety to a commonplace fruit. Because boiling does not require the addition of any fat or other cooking ingredients, boiled apples retain similar nutritional value to raw apples. Boiled apples can also be used in a number of recipes, such as apple pie. 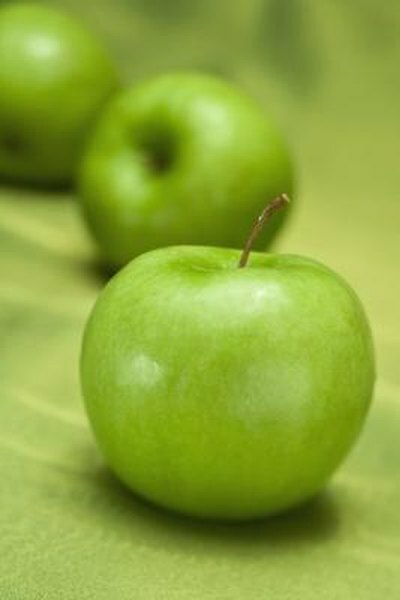 Boiled apples are low in calories, as a 100 gram boiled apple provides just 53 calories. This amount is about the same in a 100 gram unboiled apple and is less than 3 percent of the daily suggested intake of 2,000 calories. You could burn off the calories in 100 grams of boiled apple through 15 minutes of weightlifting or 11 minutes of water aerobics. A 100 gram boiled apple provides less than 0.5 grams of fat. Dietary fat makes foods higher in calories because it contains more than twice the amount of calories than protein and carbohydrates, but it does provide nutritional benefits. Your body uses dietary fat to fuel long exercise sessions and to aid in the absorption of certain nutrients. Fat also provides satiety. Boiled apples are rich in carbs, with a 100 gram apple providing about 14 grams. Carbs give your body energy to fuel everyday activities, sports and other forms of exercise. Boiled apples are not rich in fiber, provide 2.4 grams per 100 grams. Dietary fiber can help keep your digestive system healthy and might aid in weight loss, as it promotes feelings of fullness. The Institute of Medicine suggests that men eat 38 grams of fiber daily and that women eat 25 grams of fiber daily for optimal health. Boiled apples are low in protein. Each 100 gram apple contains less than 0.5 gram of protein. Protein is essential for your health because it helps build and repair your body's tissues, muscle and bone. You can find protein in eggs, dairy products, meat and fish.